You wake up - suddenly panic sets in as you realise its just a few weeks until your child's next birthday and you have absolutely no idea what to do for their birthday party. You went trampolining last year, their friend is already having a laser quest party. What can you come up with that is easy to organise, totally original and local? Welcome to Bring The Game Over! Bring the Game Over is a mobile gaming arcade van that comes to your house and sets up on the driveway. 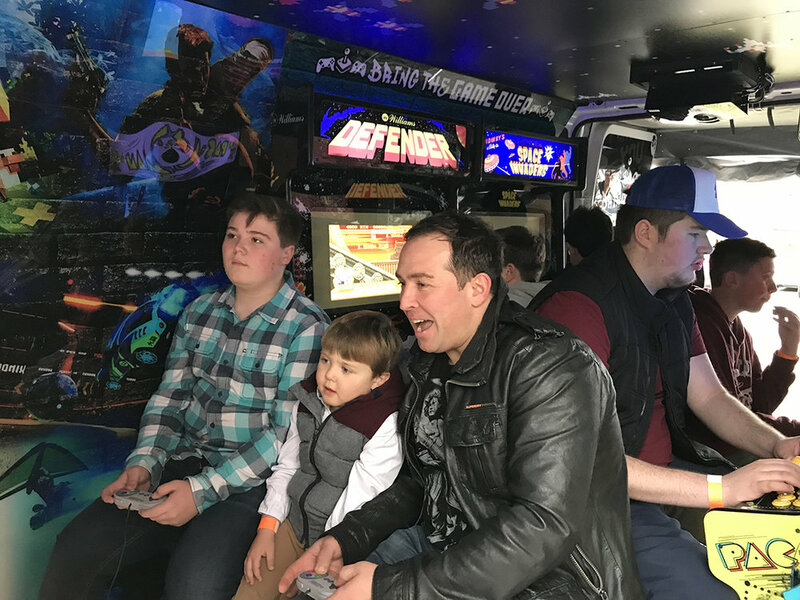 Inside the custom fitted back of the van are over 10 different arcade machines - both modern and classic that the kids can play on throughout the duration of the party. For the older generation you'll find familiar arcade machines like Space Invaders and Donkey Kong - games that the kids suddenly fall in love with enjoying their retro styling. The bus caters for state of the art modern games via 4K Ultra High Definition screens plugged into the latest consoles - Playstations, Nintendo's and XBox's. There is even a high definition projector that is set up at the back of the bus for some big multi-player gaming. At the start of the party the Bring the Game Over team arrive and spend 20 minutes setting up the bus. They'll need a power socket to plug into, and enough room to park the bus on a driveway and add a small tent area onto the back. Once set up they'll ask the birthday boy or girl to select around 5 games to be loaded up onto the consoles and arcade machines. The selection is ridiculous with classic games through to modern blockbusters. Our boys chose some Fifa, some Minecraft and (with some pushing from Dad) some classic Mario Kart! The party can cater for up to 14 kids and they all piled into the bus picking which game they wanted to play. Most were in pairs competing, and one group of four got stuck into Mario Kart. With such a wide variety of games available this party is just as suitable for girls as for boys, and there were plenty of games to keep younger brothers and sisters entertained as well. The Bring the Game Over team were brilliant, and had total control of all the kids. Parents were allowed (even advised!) to relax and go indoors and chat, prepare food and drinks safe in the knowledge that the kids were having a great time. The team running the event were totally passionate about the activity and the games the kids were playing. They were on hand to help coach those trying a game for the first time, or change the game if something was too difficult. For those kids who haven't played on a traditional arcade it was an amazing experience. There are three possible packages which you can find on their website. We had a 90 minute session for an 8th birthday party. While I am sure they would have stayed in the bus all day, it was the right amount of time. 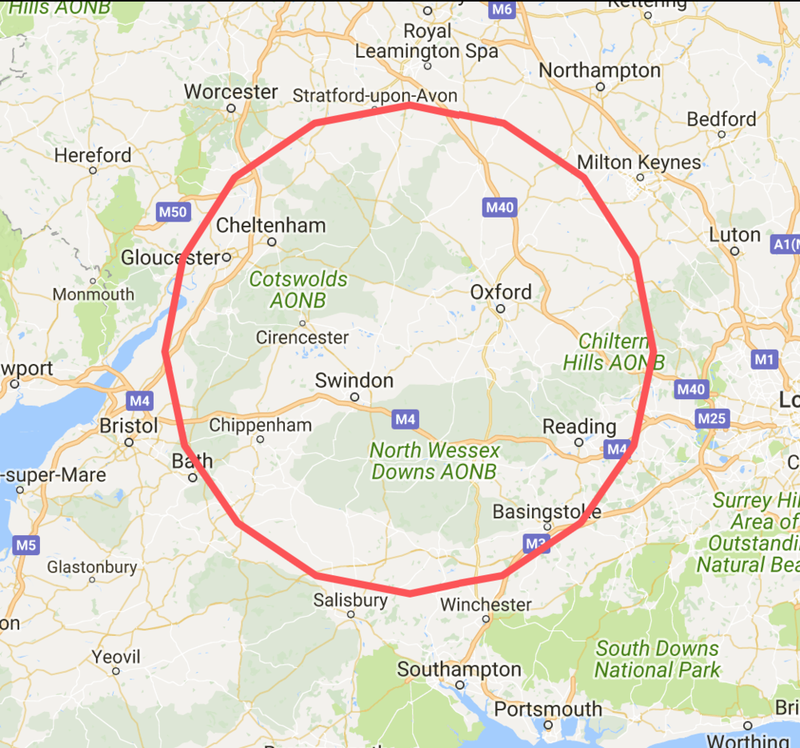 If you are in the Cotswolds you are covered! You'll see a map on their website. Would we book it again? The kids absolutely loved it and we didn't see a single one of them for 90 minutes. We've had other parties - magic or reptiles where after 20 minutes some attention wavers and you start herding children. Not in this case - it was the most relaxed party we've hosted. We loved the fact that the party came to us - we didn't need to transport a big group of people to a venue far from home, and we didn't need to ask other parents to give up their weekend to take their own kids there either. The proof is in the pudding, and our non-birthday boy asked to have the bus back in May for his own birthday. We hope you found this review useful. If you've experienced an amazing birthday for your children, or offer a great birthday activity let us know - we'd love to share it with the Kowalah network.